The Frug or French Bulldog and Pug mix is living proof that good things come in small packages. Also called a Frenchie Pug or a French Pug, this is a small dog that is cute, friendly and playful. In this article, let’s get to know this breed and find out if it will be a good addition to your family. First, what are Frug puppies? 1. Frugs are good with kids of all ages. 2. They are devoted to their owners. 3. They are undeniably cute. 4. A Frug’s coat is low-maintenance. 5. Frug dogs have a relatively long lifespan. 6. Training your French Bulldog and Pug cross will never be boring. Where can I find Frugs for sale? Conclusion: is the French Bulldog and Pug Mix for you? This designer dog is a mix of two popular breeds: the French Bulldog and the Pug. It is uncertain where and when the French Bulldog and Pug hybrid first appeared, but it’s one of the more popular designer dogs around. But what exactly makes this crossbreed endearing? Frenchie Pugs have a natural eager-to-please attitude and love to entertain when they have undivided attention. These dogs are patient, playful,and energetic, always looking for opportunities to make their human happy. The calm and easygoing temperament of a Frug makes it naturally good with kids. However, you should still supervise playtime because the dog’s small body could easily be hurt by overly curious children. These hybrids crave attention love being with their humans, with or without anything to do. 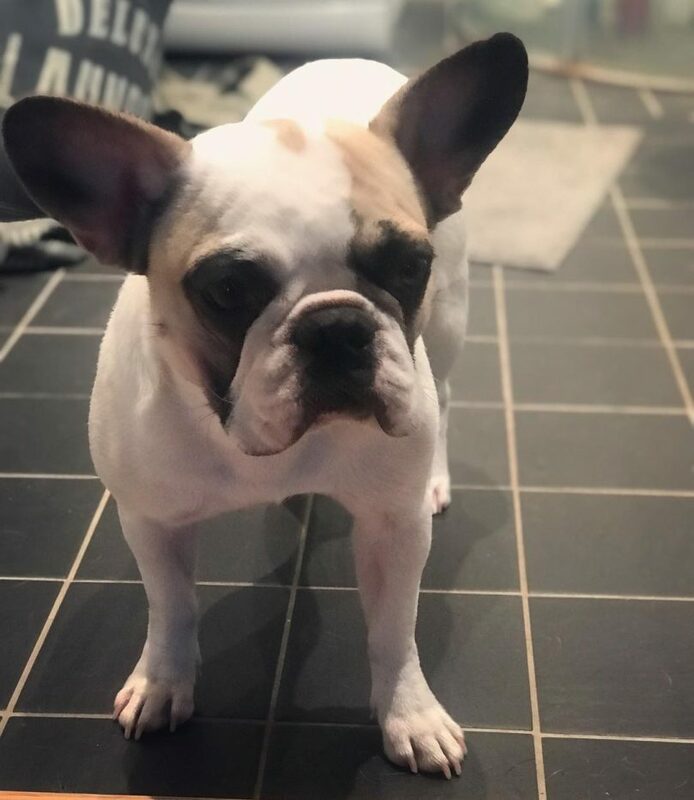 Don’t be surprised if the French Bulldog and Pug mix follows you around the house while you’re doing everyday tasks like cooking or making coffee. Some Frenchie Pugs even watch their owners watch TV. This tendency to stick close to their human’s side makes the French Pug an excellent companion dog. A full grown Frenchie Pug is around 13 to 15 inches (33 to 38cm) in height and can weigh up to 15 to 30 lbs (7 to 13 kg). They are small dogs that have compact, well-muscled bodies with short curled tails. It can be easy to predict how your Frug will look like as its parent breeds have similar facial features. A French Bulldog and Pug mix is a brachycephalic breed, meaning it has a flat face and a short nose just like its parents. Frugs usually also have folds or wrinkles around their forehead and the area around their eyes. Their ears are upright, similar to that of a bat. Once-a-week brushing is enough for their short, fine, and glossy coats to stay healthy and shiny. French Pugs rarely shed fur, but this is not a hypoallergenic breed. French Bulldog and Pug hybrids may not be suitable for owners with allergies. A French Bulldog-Pug cross has a lifespan of 12 to 15 years. Although some claim that hybrids are healthier than purebred dogs, it is still good to be aware of the health issues they may inherit from their parent breeds. Brachycephalic Obstructive Airway Syndrome (BOAS) – a condition that causes short-nose dogs to have difficulties in breathing. You may find your pup catching their breath after exercise. Atopic Dermatitis – a condition your French Bulldog and Pug mix may inherit due to the skin folds on their faces. Obesity – the Pug side of your puppy may inherit its appetite, so keep a close watch on its diet. A French Pug should consume only 1.5 to 2 cups of high quality dry dog food divided into two meals a day. A 20-minute walk per day is also enough to keep them happy and in good shape. Although these dogs love to please their owners, training a Frenchie Pug can be challenging as they can be stubborn. For this reason, this crossbreed may not be the best match for a first-time dog owner. Starting training at a young age would definitely benefit this dog. Building good habits in Frug puppies ensures that they grow up to be well-behaved dogs. It is important that they look at their trainer as the leader of the pack, meaning they would have to see their trainer as “the boss.” Training should be fun yet firm. Be patient, calm, assertive and consistent when teaching your French Pug commands. A Frug puppy’s price starts at $1200 to $2500. These puppies may be more expensive as they are one of the most popular designer dog breeds around. Like with any crossbreed, finding a breeder that is focused on the French Bulldog-Pug mix might be challenging. You can check with breeders focused on the French Bulldog or the Pug. Cute, playful, and patient, the Frug is a devoted companion. They are also low-maintenance dogs that do not require much grooming and exercise. However, they also require dedication and consistency when they are young and in training. This breed may be more suited for owners who have the patience to train dogs. 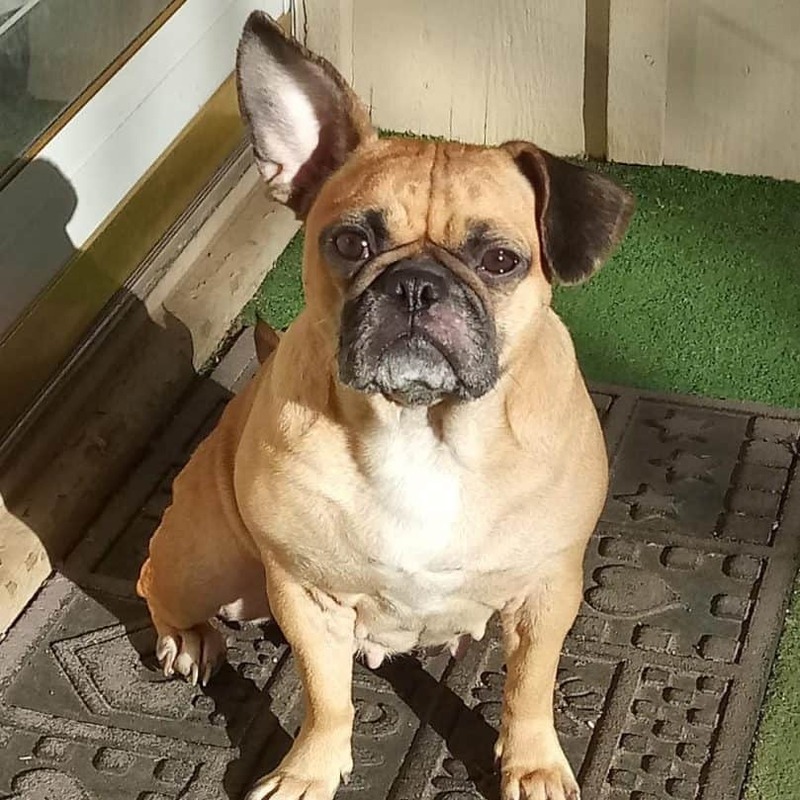 Frugs can also inherit several health issues from their parent breeds so they need an owner who is keen on going to the vet for health checks. Do you have a Frenchie Pug? Comment below and share your experiences.